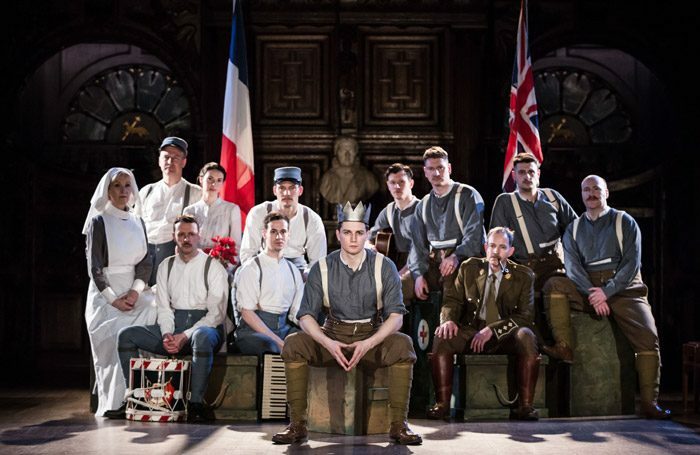 Old enemies have become allies in this poignant version of Henry V originally performed in 2015 to mark both the 600th anniversary of the Battle of Agincourt and the centenary of the First World War. Revived last year as part of the Shakespeare 400 celebrations, the production now embarks on another tour of English cathedrals. Southwark Cathedral is both grand and homely, an apt setting for a group of gassed and injured soldiers, both French and English (as is the cast), recuperating from battle in a military hospital. Together they perform Shakespeare’s play as a diversion, but directors Ben Horslen and John Riseboro ensure that this is no mere escapism. The reality of their situation is never comfortingly banished and that in turn allows for a more general appreciation of the mess, pain and terror of war as observed on the front line. For instance, when Bardolph is threatened with execution for stealing from a church, the soldier-actor playing him shudders uncontrollably from shellshock. Adam Philps carries this off seamlessly as nurses (otherwise Floriane Andersen and Louise Templeton as Katherine and Alice) rush to his aid. Individual performances are strong, including Rhys Bevan’s King Henry, but the real strength lies in exemplary ensemble playing. There is a tendency, given the traverse staging, excellent choral singing and sharing of Chorus’s lines, to a pageant effect, and the comedy is somewhat underplayed – Captains Jamy and Macmorris don’t appear at all – although Andrew Hodges makes the most of a beefy Fluellen. But Horslen and Riseboro keep the balance well between their parallel stories with the help of music, some from the period, some newly composed by Christopher Peake.